PA chairman reiterates he will not accept tax transfers from Israel if the PA’s payments to terrorists are offset. 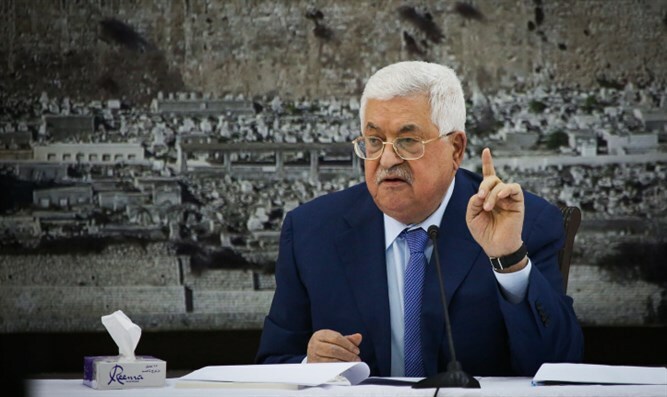 Palestinian Authority (PA) chairman Mahmoud Abbas reiterated on Wednesday he would not accept partial payment of tax transfers owed by Israel, following the Cabinet’s decision to implement the policy to offset the PA’s payments to terrorists. "We shall not accept the (tax) money if it is not paid in full," Abbas told a central committee of the Palestine Liberation Organization in Ramallah, according to the AFP news agency. Abbas also said once again on Wednesday he would not end financial support for the families of terrorists imprisoned or killed by Israel. "Every penny available will be allocated to the families of martyrs and prisoners," he said. Earlier this week, Abbas spokesman Nabil Abu Rudeineh warned Israel of “repercussions” over its decision to offset the payments to terrorists. Abbas claimed on Wednesday that Israel's decision to withhold the funds was meant to pressure Palestinians to accept a peace deal being prepared by US President Donald Trump. The US plans are to be formally presented after Israel's April 9 elections. Abbas has already rejected the US peace plan and has been boycotting US officials ever since Trump’s recognition of Jerusalem as Israel’s capital in December of 2017.